There were some twenty through freight trains in and the same number out of the terminal every day. Freight trains were not on a schedule but were called for about the same time every day. First I will explain the west bound trains. Each train had a symbol, such as a train made up in Detroit for downtown Chicago was DC-1. All west bound trains had an odd number and all east bound trains an even number, both passenger and freight. All regular trains had a symbol, but others were either locals or drags. The drags were termed “extra” and the engine number. There were three trains that went downtown to Chicago daily. Two of the trains were freight for Chicago and some empties. The third train was different and I will explain; in the early 1920’s an artificial ice plant was built in the yards at Niles. Eighty cars could be iced up at a time. There were four tracks and each track held twenty cars. Between tracks #1 and #2 and between #3 and #4 was a platform slightly higher than the refrigerator cars. The ice plant was located between tracks 2 and #3, about ten car lengths from either end of the platform. The chunks of ice, about 300 pounds, came out of the plant on a conveyor to the conveyor which ran the length of the platform. The ice was diverted either right or left on the platform to the desired location where an instrument was placed to divert it to the car being serviced. It took little effort for the loaders to get the ice down in the bunkers. The cars were iced up in the late afternoon and then taken to the west bound classification yard where the train was made up. The cars were all white and owned by the Merchants Despatch Dairy Line. They were taken to downtown Chicago during the night and were loaded the next day. Seven or eight trains went to Argo daily. As stated before, most of the meat trains were made up there. A like number of trains went to Joliet. While most of the cars going to Argo were empty meat cars (reefers), a good number of cars going to Joliet were loads, mostly automobile cars. They were fifty foot cars and could carry six automobiles; also there were empty reefers for packing plants in Iowa and Nebraska and produce reefers for the west coast. Joliet was the transfer point for western roads. That was the end of the line for the Michigan Central. There were three freight trains daily out of downtown Chicago and all three were scheduled within an hour to depart, one at about 6:15 p.m., another at 6:45 p.m., and the third at about 7:15 p.m. The first train was the all white refrigerator cars loaded with dairy products for New York and Boston. It’s symbol was N.Y.-2, to be delivered to the New York Central at Buffalo. When this train arrived at the yard in Niles, it was directed around the hump and the classification yard and was not broken up at all. When it stopped at the east end of the yard, a new engine and Middle Division crew were waiting for it. A switch engine changed way cars (cabooses) on the rear end for the new crew. As soon as the train stopped, car inspectors (car-knockers) checked the train’s running gear and brakes. If everything was in order, they gave the signal to proceed. The second train from Chicago was all mail order merchandise going to Michigan. 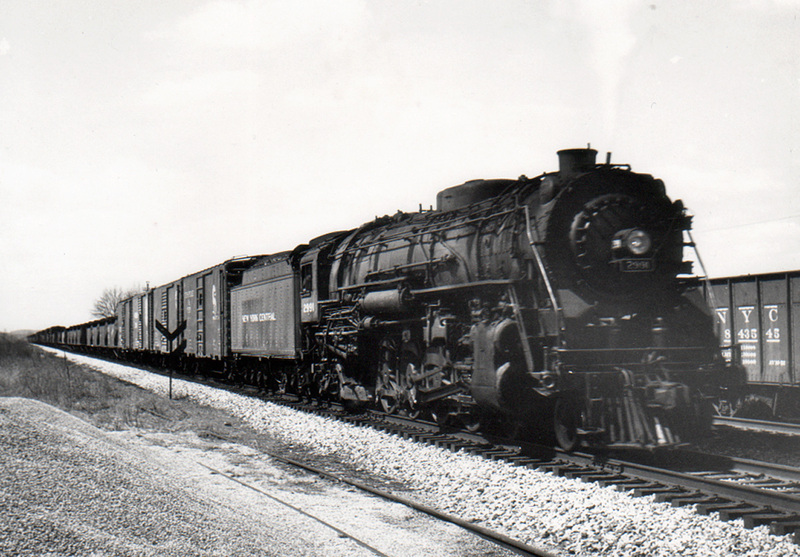 The third train was miscellaneous merchandise, mostly LCL-less than carload lots, for Michigan. These trains and all others coming in the yard at Niles were humped and classified. From Joliet, all of the trains from there were transfers from western railroads. There would be meat cars from Iowa and Nebraska and produce from the west coast. The cargo of other trains would be coal, oil, lumber, grain, etc., and they would be heavy trains. Very often a train was made up there consisting of one hundred empty fifty foot automobile cars. This was a long train and at one place on the line from Joliet to East Gary, it was necessary to get the green light on three interlockers (ground level Railroad crossings) because they were less than a half mile apart. So, at times there would be a delay there with a long train. Every day there was a train out of the Gibson yard at Hammond, Indiana. This was always a drag, a heavy train, with mostly coal and oil. There were locals that did the switching at all small towns. One local operated daily from Niles to Michigan City, another from Michigan City to Joliet. During the fruit season an extra train was put on that left Niles at 1 p.m. daily with a string of empty produce cars. It went to Galien west of Niles, then went north to St. Joseph. As they went along on this spur they set out cars where ever they were needed. On the return trip, they picked up the loaded cars. As the season progressed and especially during the peach season they would bring in as many as eighty-five cars from the twenty-five mile line. A. large engine could not be used on the line because of light rails, so an old engine had to be used. This was called the “fruit run”. The reefers used on this train were iced up in Niles. All meat cars were iced up by the packing plants and produce cars were iced up on the west coast. All freight trains stopped at Michigan City for coal and when you stopped for coal, the water tank was also filled. With the exception of N.Y.-2, all freight trains were run over the hump and reclassified, some cars taken off and some added to the train. This concludes the 3-part series.